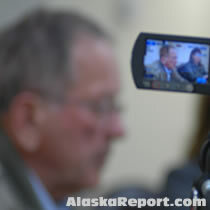 "The citizens of Alaska deserve a senator focused on their issues, not his own criminal charges"
CREW applauds the indictment of Senator Ted Stevens (R-Alaska) on seven counts of making false statements. Each count is punishable by up to 5 years imprisonment. The indictment states that from 1999 through 2006, Sen. Stevens failed to list on his personal financial disclosure forms a significant number of gifts valued at over $250,000 made by VECO, an Alaskan oil pipeline company, and the company's CEO, Bill Allen. CREW, which has named Sen. Stevens as one of the most corrupt members of Congress, has long alleged that Sen. Stevens' conduct violated federal criminal law. The indictment of Senator Stevens can be found here. CREW’s most corrupt profile of Senator Ted Stevens is available here. Citizens for Responsibility and Ethics in Washington (CREW) is a non-profit legal watchdog group dedicated to holding public officials accountable for their actions. For more information, please visit www.citizensforethics.org or contact Naomi Seligman at 202.408.5565/ nseligman@citizensforethics.org.